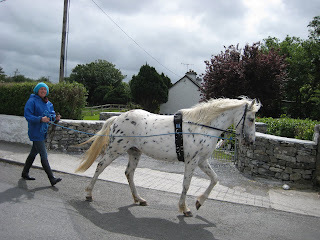 HOLIDAYS in IRELAND: Chauffeur?car and driver at Shannon airport for your Irish vacation. Chauffeur?car and driver at Shannon airport for your Irish vacation. A Killarney Waterfall in a secluded forest. This lady is breaking in a young horse and getting him used to the reins. Meeting animals on our roads is quiet common so make sure you slow down and give them the space that they need. They can be a danger if you frighten them, so do be careful. 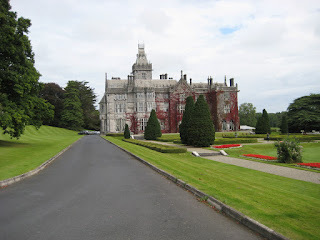 Adare Manor in the beautiful town of Adare County Limerick. This five star hotel is very popular and has its own golf course. The town of Adare is regularly voted as one of Ireland's most attractive towns. 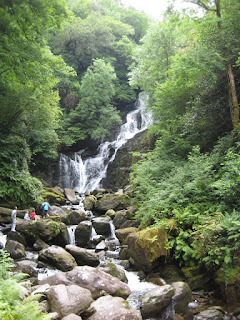 Today was a glorious day here in Ireland, beautiful sunshine and lovely cool fresh air. January has been the mildest January on record over the last ten years so lets hope we are heading into a year of warm and sunny weather once again. Choosing an airport for your arrival into Ireland is very important, and i touched on that in a recent Blog. Many people are limited in choice, because they are using airmiles, and that restricts them to only certain airlines. Most, if not all airmile tickets, seem to use only Dublin airport and this affects people who want to come into Shannon. I have people coming to me who get around this by flying into London and then catching a Ryanair flight (buget airline) from London to Shannon. This can be a great way to do it especially for people who want to spend a couple of days in London also. The Ryanair flights are extremely cheap eventhough you have to be careful about luggage as they will charge by weight over a certain limit. Make sure that you travel as light as possible anyway as you really do not need any fancy clothes coming to Ireland. Smart casual is acceptable everywhere, and just make sure that you have jeans and a sweater, warm underwear, and light rainwear. If your destination is the western region, anywhere from Cork and Kerry to Clare and Galway, Mayo, Sligo and Donegal, then Shannon is your man. If you want to visit Dublin also then maybe you can arrange your return flight out of Dublin when going home again. You can also do it the other way around by flying into Dublin and out of Shannon My chauffeurdrive service covers Dublin Shannon Cork and Knock, so anywhere you like and i will be there for you. your blοg through Googlе, and found that it is truly infοrmativе. you contіnuе this іn futuгe. Νumerous peοplе ωill be benefitеd from yοur writing. Hi, I do believe thiѕ is an eхcеllent site. Ι stumbleduρon it ;) I am going tο cоme baсk oncе again since i have book marκed it. change, mаy yоu be rіch anԁ continue to guiԁе othеr peoρle. Ρleаsе do keep up the excellent b.